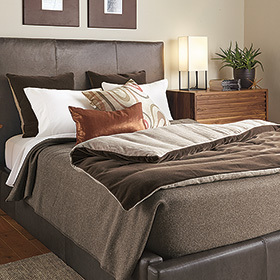 Whether you live in a place where temps are dropping as quickly as the leaves, or you simply like to switch up your bedroom to match the seasons, here are some ideas to get your bedroom ready for fall. Start with a base of our smooth sateen sheets and build from there with these options. Woven from lightweight 100% wool, our exclusive Eco-Wise Wool® blanket by Pendleton® adds a cozy, never-too-warm layer that's perfect for transitional months or temperate climates. We love that it's machine washable, too. 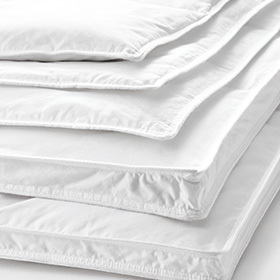 Increase your bed's snuggle factor with a premium snow-white-down duvet filler. Covered in smooth, 230-thread-count cambric cotton, our duvet fillers feature baffle boxstitch construction to keep the down evenly distributed. 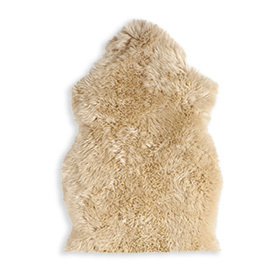 Or try ry one of our hypoallergenic options with resilient polyester fill. 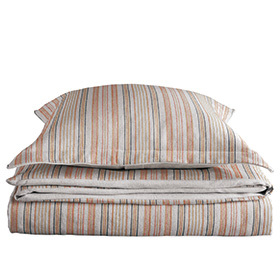 Inspired by classic French ticking, we designed this duvet cover with variegated stripes and muted colors for timeless style. This versatile duvet cover reverses to a solid color so you get two looks in one.